Adventures in Mississippi: Holy Christmas, Coke-Santa! 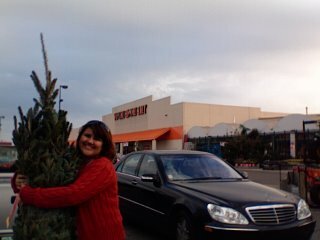 Erin and the Home Depot Christmas Tree! I gave in full-force to the Christmas spirit this weekend. Scott, the pastor at Handsboro Pres, would be correcting me at this point- noting that I actually gave into the Holiday spirit this weekend. He preached on the difference between celebrating the holidays (Christmas, Channukah, Kwanza, Festivus, etc.) and celebrating the birth of Jesus. I did not spend enormous amounts of time sweeping mangers, knitting baby blankets, cleaning camels, or even reciting the nativity story. I simply went out to get a Christmas tree. 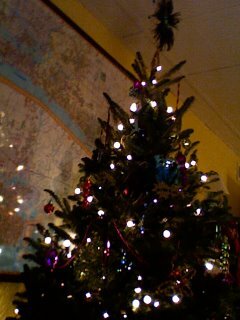 My housemate Linda has been desperate for a Christmas tree since the week of Thanksgiving. Many who know me know that I don't do Christmas until after Thanksgiving weekend. I get angry at stores who fill their holiday displays in October. I refuse to buy ornaments, cards or gifts until December on principle. It's ridiculous, I know, but I mean it. Linda waited patiently for me to be ready to prepare for Christmas. We tried to make it a family adventure. We tried to go cut down a Christmas tree at a near-by farm. I had told Linda about my favorite family adventures to Smoky Glenn Farm, getting the cider, hopping on the hay ride out to the tree fields, cutting down the tree, eating pie and sipping coco while enjoying carols in the background. It's almost a Norman Rockwell painting. But I loved it. And Linda loved the idea of it, so we went. Problem was, the whole family didn't go, it wasn't cold enough out for cider, and the tree farm wasn't selling trees! I should have known we were in trouble when we walked up and there was a "Caution: Fire Ants!" sign taped to a giant candy cane. This "tree" farm was selling bushes, cut in the shapes of trees. We ran out of there and began searching for a tree lot in town- something to support the firemen, boy scouts, Kiwanis club, anything.....nothing. We ended up at Home Depot picking up a tree wrapped in twine off the line. We never opened it up. Just bought it to be done with the chore. 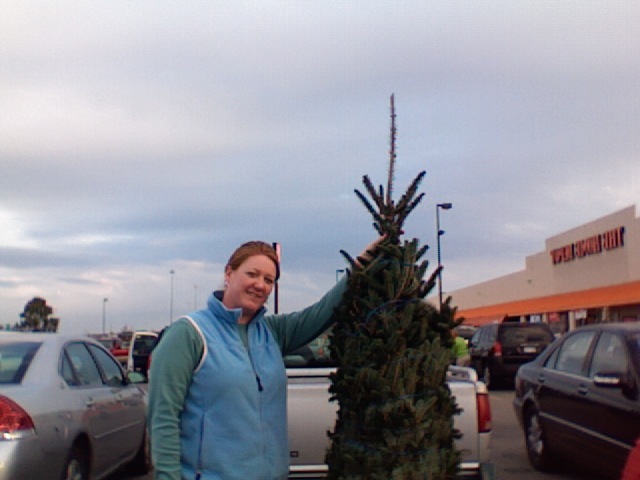 We took the tree home and set it in the stand- in which it didn't fit- tree was too small. Somehow we got it to stay in place and opened it up. Pounds of dead tree fell out, along with some dead pine cone pieces and a few bugs. Where's the Norman Rockwell in that? To try to get Linda to stop crying, I made a swit move to get her out of the house. We took off for a Christmas Cantana at Long Beach Presbyterian Church. This didn't stop the crying, but did change the mood. It was fantastic. A choral group from Trinity Pres in Meridian, MS had come down to sing on the coast at the church where one of their own is now working. That twenty people would give up a holiday-season weekend to sing for their missionary and his new church, it just made me beam with warm fuzzies (and well with tears, per usual). They sang hymns and helped Linda and I to remember that Christmas isn't about the tree, the weather, our families and home congregations, but it is about celebrating the joy of Christ- his love, peace and forgiveness. On the way home, hearts full of hope, we drove by a Coca-Cola truck all light up for Christmas. There was a Santa in the truck and they were honking and waving at everyone they saw. They ended up parked outside the K-Mart across the street from our church. I know that this story now sounds like one of corporate cheesiness gone wild, but there was something about that Coke-Truck-Santa that made me feel just as bright as the Cantana. They we're hauling soda that night- they were driving around, rocking out and ho, ho, ho-ing. And it was their job. Someone paid them to spread holiday cheer. I'm not going to be the girl that promotes big business, ever, so don't worry. All I know is that the Coke-Santa gave me a candy cane and made me smile on a long day. Just the same way Linda's pretty tree made her smile. The children's concert down the road made Brenna and Sarah Ann smile. A day of uninterrupted football watching made our boys smile. I don't need the Norman Rockwell painting. I don't need a manger scene in my bedroom. I just need the little every-day reminders that there is much hope, love and joy in God's world. And those reminders come from all over! Linda loves the Home Depot Tree. 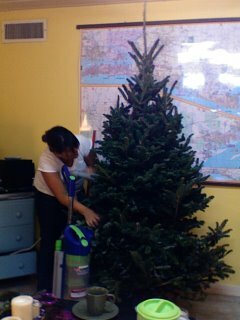 Linda not loving, but vacuuming the death out of the Home Depot Christmas Tree. Now we're all happy with the tree!